A winning entry, first past the post ~ whether for function or decoration, a Granite Bollard from J.H. Wagner & Sons is both practical and stylish. 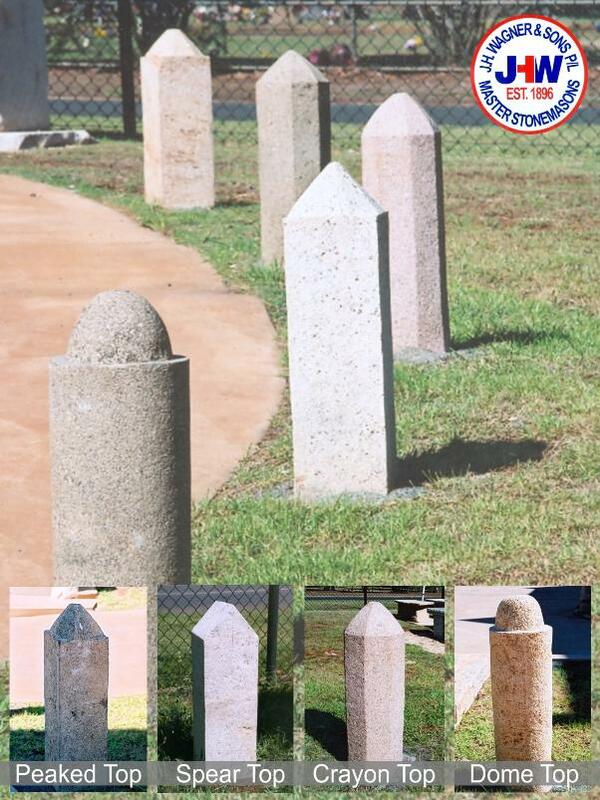 As Garden Dividers: A bollard or granite feature post may be used to prevent vehicle access, define a path through your landscaping or used as a directional post. Custom designs may also incorporate lighting, chain hooks and even connecting rails. The variety of shapes, sizes, finishes and colours provide style and function, symmetry and aesthetic design in any landscape. Chose from our stock Bollards or arrange for individual manufacturing. As decoration: A Bollard is an ideal stand alone garden feature, great for breaking up an expanse of lawn or garden bed. Use them even as a sundial post or a sign post. Create your own garden art masterpieces by using the Bollard as a base for a whimsical twisted steel ornament. The approximate sizes of the Crayon Top, Peaked Top and Dome Top are 1150mm high x 200~230mm x 200~230mm, including rough base not seen approx. 430mm. The Spear Top bollards are approx. 900mm high x 200mm x 150mm. Ex stock prices only. Subject to change without notice.